No pics but primer has been applied and it’s looking really good. All those scuffs etc have disappeared. Hoping to get the base Bronze Green down tomorrow once the primer has fully cured. Basecoat is down, wheels, tracks and skirts are on. Wheels were a pain in the *** to put on. The provided poly caps were way to small and tight. Ended up having to cut the swing arms and using CA to get them into the right position. Looking forward to the detail work and getting her completed. Here is my entry to this campaign. 17 pdr tank destroyer Archer - Tamiya newly released kit in 1/35 scale. In short, Archer was an attempt to quickly adopt new 17 pdr anti-tank gun to the tank before more elaborated turreted vehicles like Firefly became available. As the time was critical British engineers took Valentine tank hull, elongated it and installed massive 17 pdr gun in open casemate.size and weight of this gun forced to place it in reverse position with 22deg angles to both directions. 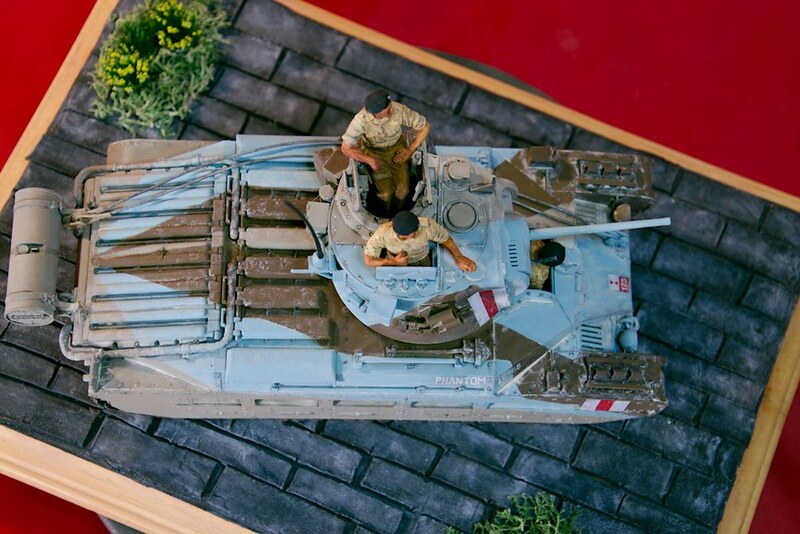 That gave the unique appearance of the tank underway - it seemed that it moves backwards. The crew of 4 was exposed to elements in the open compartment with a very tricky position of the driver - directly behind the gun breech. That forced driver to abandon its position while firing - at the time his function was a field observer. A surprisingly reversed position of the gun was somehow advantageous - after releasing some rounds and driver's jumping back to its station the tank was able to change its position at full speed forward. That was crucial capability since armour of 20mm was practically non-existent. 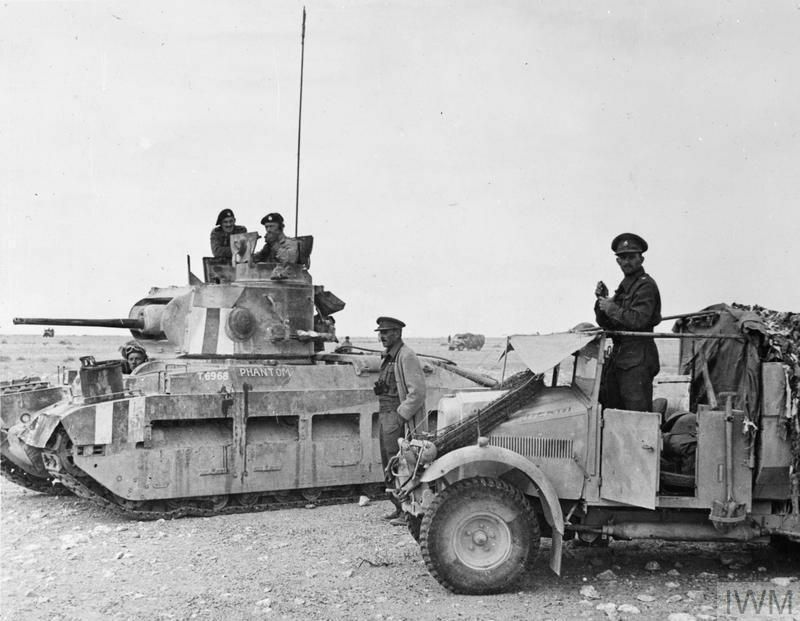 What is interesting this apparently obsolete design tank was in service in British army into early 50'. 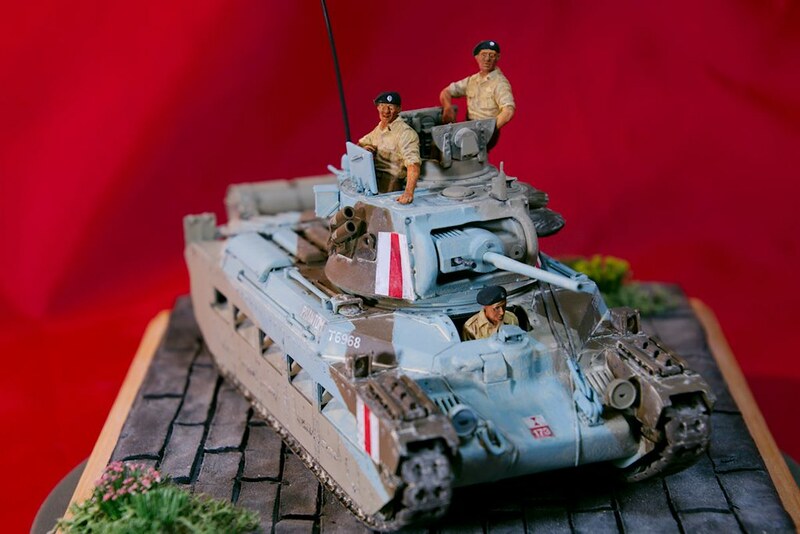 The model of vehicle I will build was fighting in early 1945 in Northern-West Europe in 2nd Anti-Tank Regiment of 3rd Canadian Infantry Division. Nice pick. 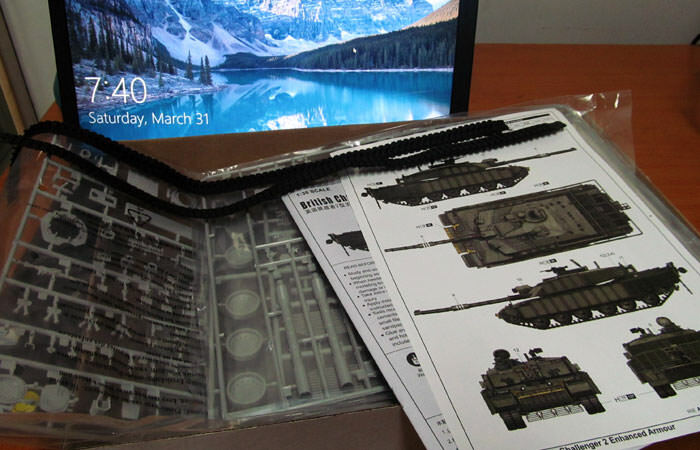 I have this kit in my stash so your build will have my interest. Good luck with it. 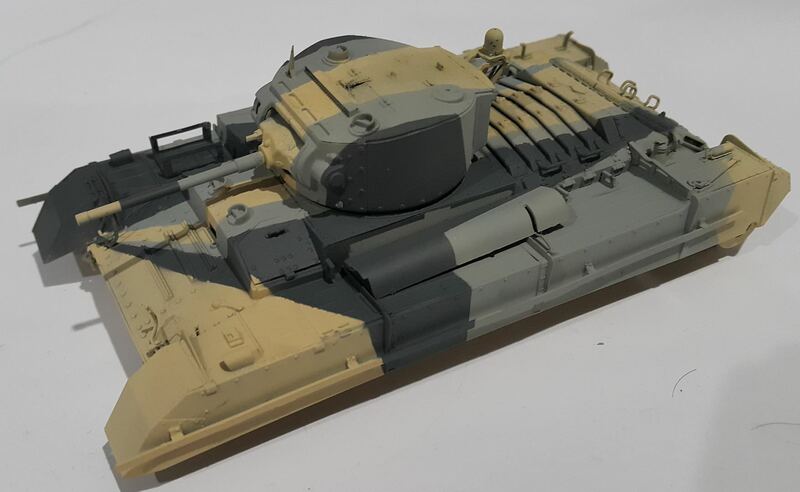 Here is a quick update on my Tamiya Matillda Mk III/IV kit #35300. 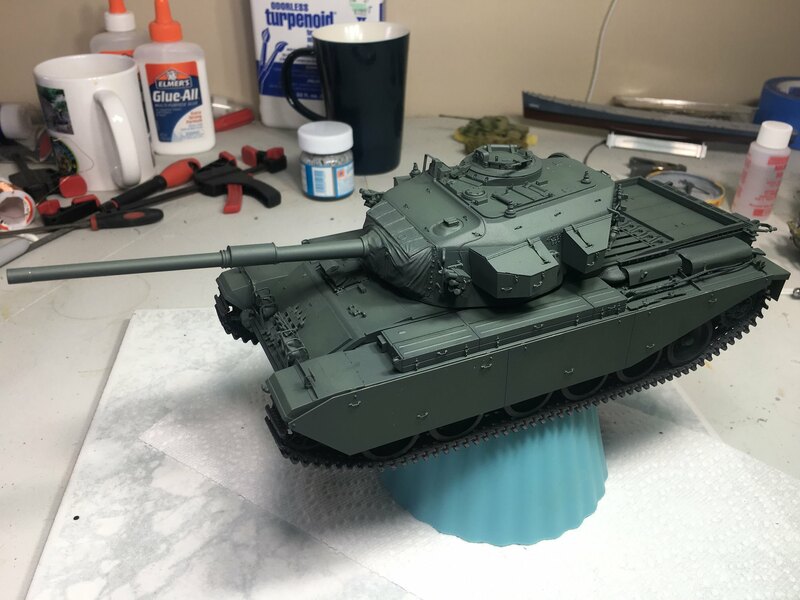 The tank is fully assembled and painted along with the gloss coat. She is ready for decals and weathering. I manage to break off a few parts and where lost to the carpet monster. I should have the final photos in a day or two. I am calling my Tamiya Matillda done. The figures stink as this is my only third attempt at them, but practice makes perfect and do I need the practice. The markings are for a Matillda in North Africa, 1941 so I covered it with sand. Here are a few photos of the final there will be more on the campaign gallery. Very well done Mark. I think the figures are quite good for a 3rd try. Better than my 3rd try for sure. You have done the venerable "Phantom" proud. tHanks for joining in. That is one sweet looking Matilda Mark, well done! 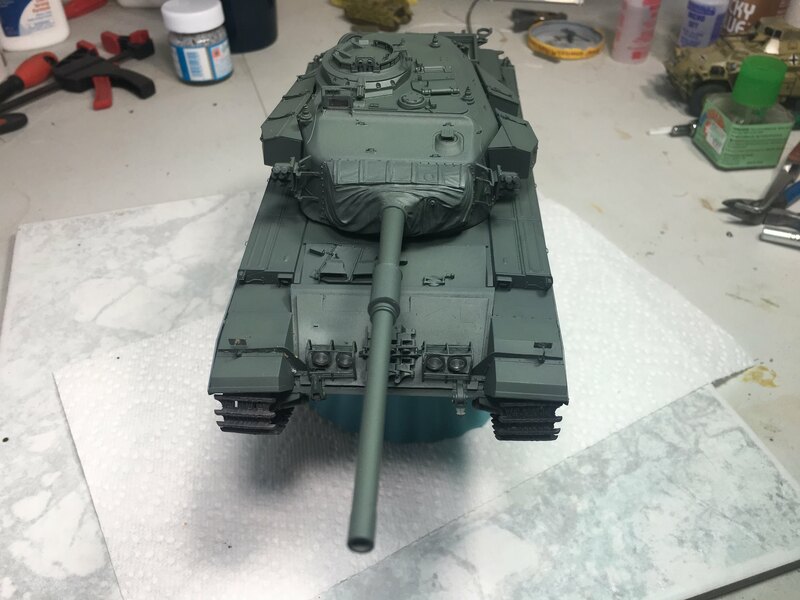 My Valentine is ready for paint and had been primed since this photo. It looks nice with Matilda, Mark. 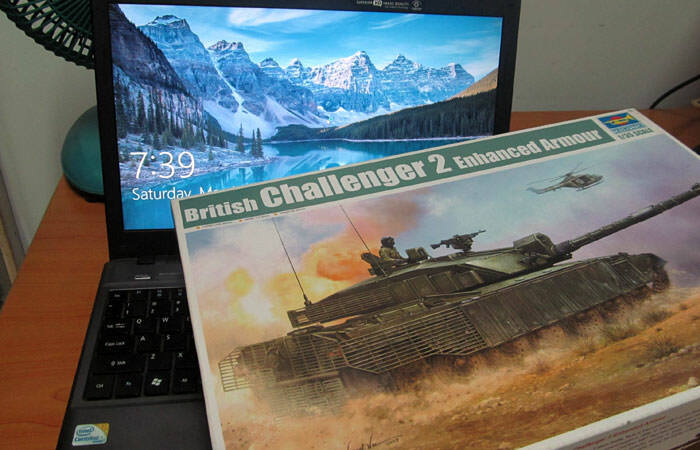 I start the modern Challenger 2 for this campaign. What color and brand did you put on? I like the look of it, not to yellow or brown. The Valentine looks great Iain. The paint is Humbrol, and it's a custom mix. I originally made it for my M3 Stuart, and it was a mix of 83, 94 and 63 with some old flat white that was starting to yellow. I mixed it purely by eyeball for the Stuart, though it's mostly 63 and white, and then emptied the tin of "white" into it to lighten it up for the Valentine so that it's the same colour but with a different tone. So masking for a caunter scheme is painful. Theses are the same colours I used in on my M3 Stuart with some tonal adjustments. The second colour has gone from a medium grey-green to a medium grey-blue and my darker shade has lost some of it's brown/khaki tone and tended dark grey. Very nicely done Iain. Love the colours. They really accentuate the scheme. If you are interested, one way to limit bleed under the tape is to have a gloss finish on the coat you are masking. The tape seals better. Another is do very light fine coats of the top colour along the edge of the tape first, allowing it to dry before applying the next coat. 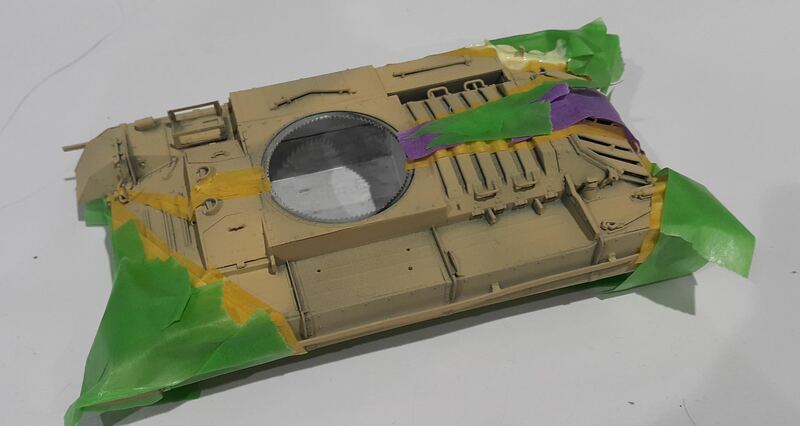 Paint over the tape onto the model, not on the model in the direction of the tape edge to avoid air pushing paint under the tape edge or along any grooves. Build the coats up very gradually until there is just enough colour to hide the base colour. Light coats also helps avoid paint lifting when you peel the tape off. A third method is to paint with the masked colour first. The idea here is to let the masked colour bleed in under the masking tape and seal it. Example: Paint yellow. Put on masking tape to mark out the area where there should be green instead. Paint yellow to seal the masking tape and thus protect the yellow area under the masking tape. Paint green. Remove tape. First comparison of 17 pdr gun and Valentine being the base of Archer. Here are some construction photos. Some holes to be filled, grove visible is an moulding artifact - on the other side is a running gear mounting point point. Driver's post with some Eduard's parts attached. Note lack of the dashboard as it will be installed later, after painting. Gun. Primed with grey Surfacer 1500. 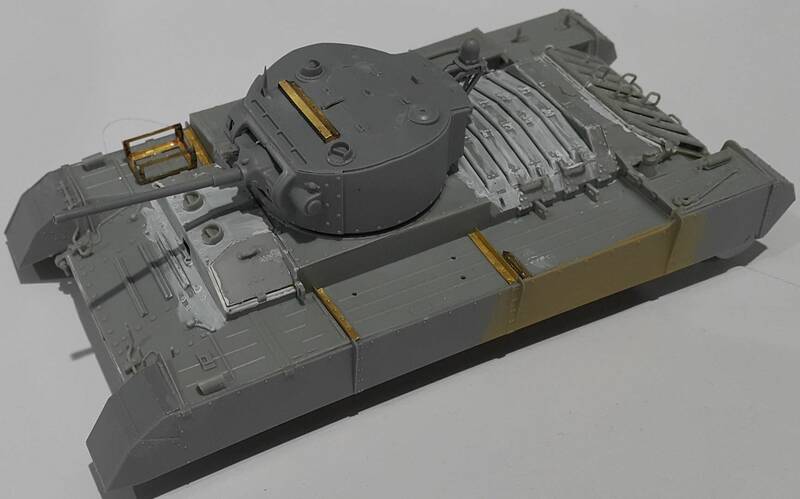 Note that Tamiya depicted gun breech as open, but handle position (left from a breech) upwards indicates it shall be closed - what I did with a small modification of the parts. The whole module will be installed after interior painting. 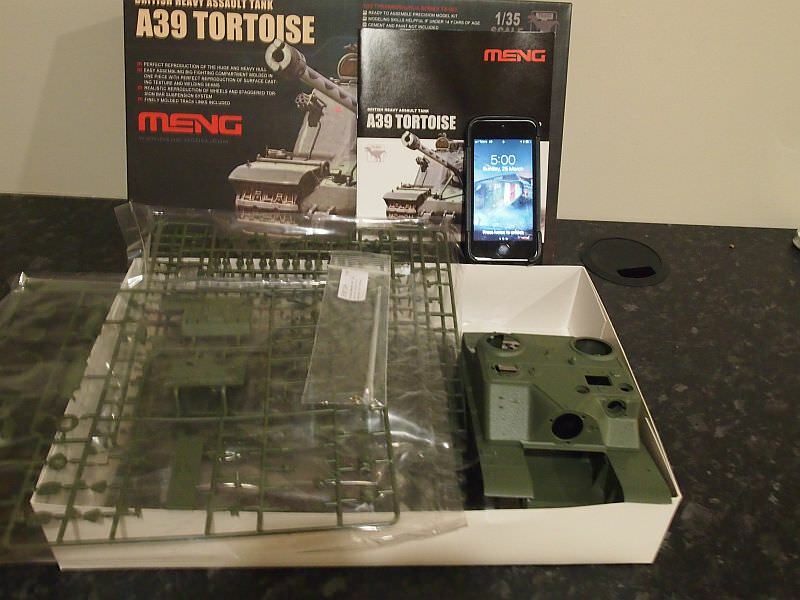 Tamiya's engineering makes it easy - just press and click. Lower interior. Nothing special with some PE parts and sanded out holes. Upper interior. On the wall visible half of the crew seats folded - ther half will be attached after painting. These seats when used were attached to the nooks visible on the fenders tops. And finally all modules dry-fitted. What is clear that interior was extremely tight for the crew of four. On the photos, some parts are still missing like a light machine gun and Sten guns and of course front wall. But this will come after painting the interior. At this point, I will attach complete running gear too. 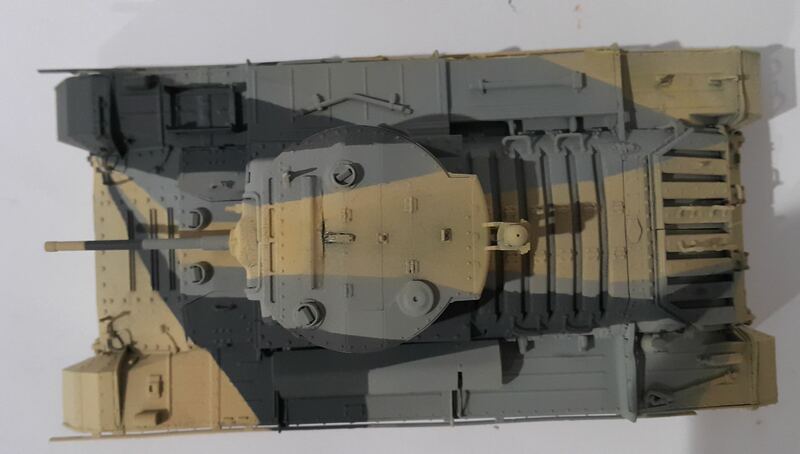 For painting, I will use custom-made mix of SCC15 (5xXF-61 Dark Green, 2xXF-62 Olive Drab, 3xXF-3 Yellow). Looking very busy Damian. Lots of detail painting to look forward to. 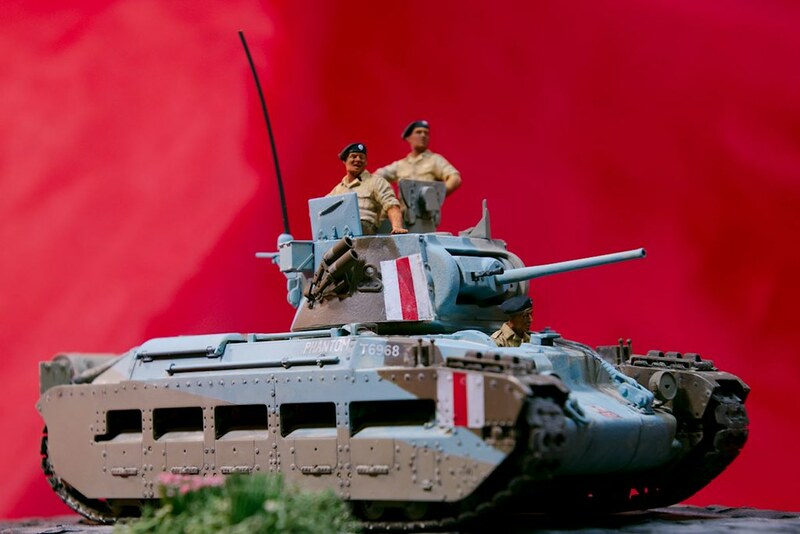 Love the pic with the Valentine Gun Tank. Easy to see why the 17 pounder was not fitted in a modified turret! Your build is coming along nicely, looks to be a clean assembly. 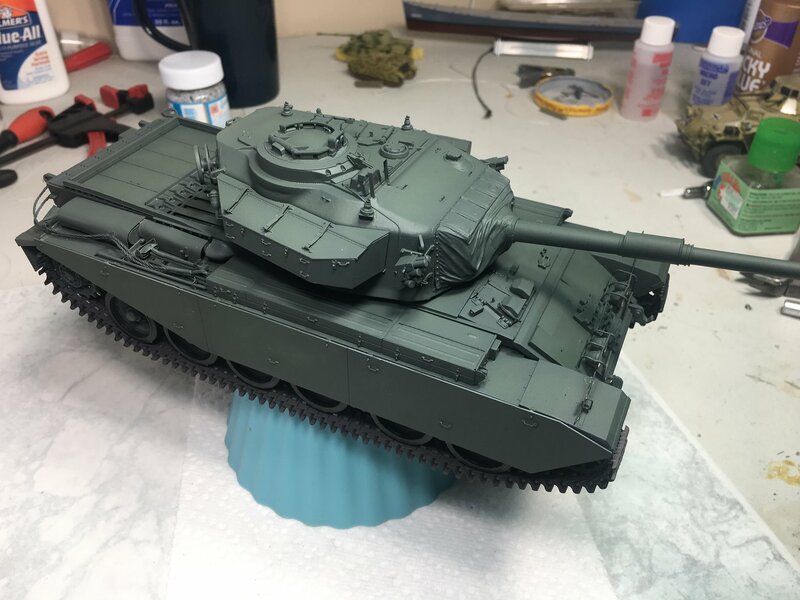 Looking forward to the paint work. Thanks Gents. Yeah, I have found this gun laid on the Valentine tank quite ridiculous, but I think it shows very well the scale of the challenge designers were faced against. Meanwhile, I had given some attention to the radiator external surface moulded on the rear deck. Aluminium true metal paint from AK, followed by dark brown panel accent from Tamiya then dirtied more with Engine Grim and finally dusted with Light Dust deposit, both from AK. It may sound like overkill for an area being barely visible, but IMHO it works nice, especially when just after last step it lost its excessive shine. So now when I dry-fit rear deck engine cover it is visible under a certain angle and light conditions. Removed by original poster on 04/13/18 - 18:56:52 (GMT). Removed by original poster on 04/13/18 - 18:57:43 (GMT).